With three small private colleges in southwestern Vermont preparing to shut down at the end of the spring semester, students are scrambling to transfer to other schools, and hundreds of faculty and staff are about to lose their jobs. The closings of Green Mountain College in Poultney, Southern Vermont College in Bennington, and College of St. Joseph in Rutland, announced over the past three months, have stunned local communities. And the impending loss of the three colleges is raising questions about the shape of higher education across the wider region in the years ahead. The closings were triggered not by academic failures, but by the colleges’ deteriorating finances. The College of St. Joseph was facing an April 1 deadline from the New England Commission of Higher Education, which accredits private colleges in the region, to improve its financial picture or lose its accreditation. The accrediting organization had put Southern Vermont College on notice in January for the same reason. Although each of the colleges has taken a slightly different path to its demise, the financial pressure facing all of them has an underlying cause: a shrinking population of college-bound high school students – a problem that is only expected to worsen over the next decade. Nationally, college enrollment increased more than 50 percent from 1990 through 2011, according to federal figures compiled by the National Center for Education Statistics. But the numbers have leveled off over the past decade and have actually declined somewhat in the Northeast. The shrinking pool of incoming students has put pressure on colleges across the region to close or merge. Some, like Goddard College in Plainfield, are operating under probation from accrediting organizations while they try to shore up their balance sheets. By the latter half of the next decade, though, colleges are facing what some are calling a “demographic cliff” – a sharp drop-off in the number of college-aged students resulting from reduced birth rates around the time of the financial collapse of 2008-09. Experts warn that the colleges most at risk will be small, private institutions in rural areas of the Northeast and Midwest – especially those that, like the three local colleges preparing to close, have small endowments and depend heavily on tuition for their operating revenue. But some say there is still a vital need for smaller, non-elite colleges like the ones that are closing, and alumni, parents and others have launched last-ditch fund-raising efforts in an effort to save both Green Mountain and Southern Vermont. Green Mountain College faces the west end of Main Street in the village of Poultney, along the New York border about 20 miles southwest of Rutland. Founded in 1834 by the Methodist Church, it went through several changes of name and mission before it became a junior college for women. It switched to a co-ed, four-year school in 1975, amid another era of college closings. In 1995, Green Mountain set its focus on what it called environmental liberal arts, emphasizing sustainability in energy, agriculture and public policy. It also offered training for hotel and resort management as well as traditional liberal arts subjects. The college has consistently won national recognition for its efforts to train the next generation of environmental advocates and create a green campus. In 2012, encouraged by students, Green Mountain set a goal of running its campus completely on renewable energy by 2020. In 2006, the college launched five online degree programs, a common strategy for schools to increase revenue without having to make a substantial capital investment. This year, it had about 450 undergraduate students on campus and 280 others, nearly all of them graduate students, enrolled online. But its president, Robert W. Allen, has said it needs 600 tuition-paying undergraduates just to cover its operating costs. The college has 40 full-time faculty members and a total staff of about 150. With its current enrollment, which has been falling for the past six years, the college has an annual operating deficit of about $5 million. Over the last 10 to 15 years, Green Mountain improved and updated its campus buildings and systems. Last April, it refinanced its debt by taking out a $19.5 million, 35-year low-interest loan through a U.S. Department of Agriculture program for rural development. With its total debt of $22.5 million now dwarfing its endowment of $2.9 million, Green Mountain started looking for partners to help stabilize its finances. The search proved futile. “Despite our noteworthy accomplishments related to social and environmental sustainability, we have not been able to assure the economic sustainability of the college,” Allen wrote in a grim letter posted on the college’s website. On Jan. 23, Allen and the school’s trustees announced Green Mountain would shut down after commencement on May 19. Maus-Pugh identified three factors that led to the college’s demise. “It starts with a decline in the college-age population in the Northeast,” he said. With fewer students available to recruit, “there’s more competition at all levels of higher education,” Maus-Pugh explained. To combat declining enrollment in a market like this, colleges typically start offering more financial aid, effectively dropping their prices in an effort to attract students. “The revenue goes down, even with the same number of students,” Maus-Pugh said. Another problem, he said, is that the financial collapse and recession of 2008-09 sharply reduced many families’ ability to pay for college. Some parents saw their incomes slashed because of job losses, while others who had planned to pay for college with home equity loans found the value of their homes had shrunk. For now, Maus-Pugh and other administrators at Green Mountain have turned their focus to helping students transfer to other institutions. Green Mountain has made “teach-out” arrangements with nine colleges and universities that offer similar programs, ranging from nearby Castleton University to Prescott College in Arizona and Alaska Pacific University. These teach-out partners allow students to transfer their credits and are waiving transfer fees and trying to match the financial aid and tuition packages that students were receiving at Green Mountain. The impact on the town of Poultney will be profound. Green Mountain students and staff members shopped locally, and students filled jobs at local businesses. Faculty and staff sent their children to local schools and participated in local organizations. Townspeople attended the college’s cultural and sports events, and local schools benefited from college volunteers and resources. The college brought young people to a graying region, and some of them stayed on. Green Mountain graduates have contributed to Rutland County’s renewable energy industry and the local sustainable agriculture movement. No one knows for certain what will become of the college’s buildings and 155-acre campus, which has been central to Poultney’s identity for decades. Most of the property will be turned over to the school’s creditors, the USDA and Key Bank. A number of proposals for the campus are under discussion, but nothing is definite, Maus-Pugh said. How and whether the campus is repurposed will have direct financial impact on the town. The Rutland Herald has reported, for example, that the college was covering 15 percent of Poultney’s water and sewer costs. Ed Bove, the executive director of the Rutland Regional Planning Commission, said his agency has hired a consultant to assess the college’s economic impact in Poultney. The commission has applied to the USDA for funding for a community planner to help the town apply for grants. In recent years, Poultney had already lost its only local bank, and its downtown cooperative food market also shut down. Even if the college had survived, the town “might have needed assistance,” Bove said. To its advantage, Poultney has a compact downtown “with a lot of redevelopment and reuse possibility,” Bove said. The college campus has a biomass plant, photovoltaic panels and a farm as well as energy-efficient dormitory, office and classroom buildings and food service and athletic facilities. Bove expressed optimism that the property will be preserved and adapted to new uses. In Bennington, Southern Vermont College sits above downtown to the southwest, facing Bennington College across the valley. Its 371-acre campus spreads up the forested slopes of Mount Anthony. The center of the campus is the Everett Mansion, a gray stone castle built in the early 20th century by the businessman Edward Everett, who also helped to found the Bennington Museum. The college traces its roots to St. Joseph Business School, founded in 1926 in downtown Bennington. 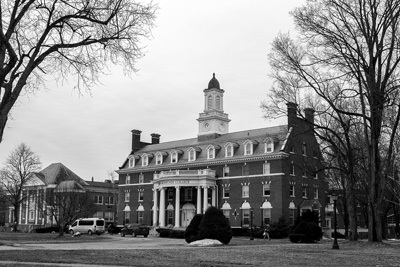 It became a junior college in 1962, then moved to its current campus and became Southern Vermont College in 1974. The college’s mission statement affirms “a deep belief in the potential of every individual.” It has specialized in providing career-related undergraduate programs especially for students whose incomes and backgrounds might not otherwise have allowed them to earn a college degree. Students who are the first in their family to attend college make up 47 percent of Southern Vermont’s enrollment, and more than 80 percent of its students receive need-based financial aid. A little more than half of its 340 students live on campus; the rest are commuters from nearby Vermont, New York and Massachusetts, which is also the home of most of its overall student body. Attempts to recruit students from outside the region have met with mixed success, college President David R. Evans said. About a third of SVC’s students are in its nursing, radiologic technician and related health care programs. Other popular majors are criminal justice, psychology, business and communications. Like Maus-Pugh at Green Mountain, Evans pointed to the overall decrease in the high school population as a contributor to his college’s demise. “It’s a large-scale, regional trend affecting a lot of colleges, putting at risk colleges that serve a lot of low-income and first-generation students,” Evans said. And as at Green Mountain, Evans said Southern Vermont has had to increase its financial aid to students in recent years as it attempted to keep enrollment from declining. But its current enrollment of 340 is far below its peak of about 500 students in 2012. Southern Vermont invested in new campus buildings in the 1980s and ‘90s, including student housing, a gym and other facilities. Another dormitory went up in 2011. In the early 2000s, the school’s board of trustees moved to defer some of its debt and draw down its endowment, leaving about $3 million. The college has about $6 million in debt, most of it to Community Bank, as well as a smaller loan from the Bank of Bennington. Evans said the college might have survived if its nursing program hadn’t run into accreditation problems in 2012. Rumors that the program had closed proved impossible to dispel, he explained. Most of the decline in the college’s enrollment in recent years reflects lower participation in its nursing program, he added. Last year, the college formed a partnership with Southwestern Vermont Medical Center in Bennington. When the college’s nursing students completed their degrees, the hospital would hire them and reimburse their tuition costs if they remained in the area. Keeping students who had already enrolled was also challenging, as only about 43 percent of Southern Vermont College freshmen in recent years have stayed to complete four-year degrees. However, for the type of students Southern Vermont serves, “we pretty significantly outperform the predicted national graduation rates,” Evans said. National studies show the graduation rate for students of similar backgrounds averages in the mid-20s, he said. When Southern Vermont learned it was under scrutiny by its accrediting organization, it immediately stopped recruiting for the incoming freshman class. After a meeting with college officials and reviewing the college’s finances, the New England Commission of Higher Education voted on March 2 to withdraw Southern Vermont’s accreditation effective Aug. 31. On March 4, the college announced its plan to close. In mid-March, college officials announced they would appeal the commission’s ruling. But the college dropped the appeal five days later because it couldn’t raise the $50,000 deposit needed to pursue the appeal. Southern Vermont College has made teach-out agreements with 15 other schools with comparable programs and costs. Castleton University will accept transfer students pursuing a bachelor’s degree in nursing, for example, while Norwich University in Vermont offers criminal justice. Evans said many commuter students may choose to transfer to the Massachusetts College of Liberal Arts, a state school in North Adams that traditionally has competed with Southern Vermont for students. Others will face long drives or have to move to a distant campus. As of late March, Southern Vermont was still in talks with various schools about the possibility of continuing a four-year nursing program in Bennington, Evans said. Apart from the loss of jobs created by the college closing, Evans said the loss of Southern Vermont College could mean fewer young people ready to join the local work force. Southern Vermont College produced local graduates ready to work not only in nursing, where there is a severe shortage, but also in law enforcement, mental health services and business. The Bennington police chief and Bennington County sheriff, for example, both are graduates of the college. Given the labor shortage in the area, support and administrative staff should have no trouble finding new jobs, Evans said. Faculty may have it much harder, given that many similar colleges are either closing or cutting back. “Money is really, really tight in higher education in this region,” Evans said. Vermont has no four-year public colleges at the southern end of the state, and there was some talk of trying to bring the Southern Vermont campus into the state system. But with the state system already struggling with funding and facing the same demographic challenges, that seems unlikely. Preserving the natural and historic value of the Southern Vermont campus is a priority, Evans said. The Everett Mansion is on the National Register of Historic Places, and 215 wooded acres are under a conservation easement with the Vermont Land Trust, which has first option to buy them. The college’s admissions building will return to its donor, Evans said. One question is what will become of the Laumeister Art Center, the former Bennington Center for the Arts, which was turned over to the college two years ago. Under the terms of the gift, the center can only be transferred to another nonprofit that will continue its use. 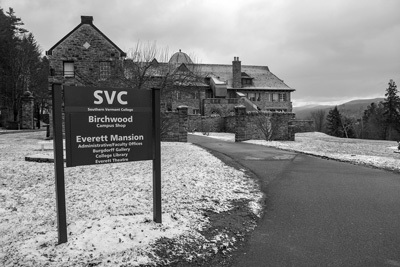 The end of Southern Vermont College “is a significant loss to the area,” said Bill Colvin, assistant director at the Bennington County Regional Commission. It is a special blow to Southwestern Vermont Medical Center, which was counting on the college’s nursing program to provide critical staff, he said. The college was leasing off-campus office space for its nursing program. If the program isn’t picked up by another school, it will leave a vacancy downtown, Colvin said. The college also was a partner in the Bennington Redevelopment Group, which is renovating four acres in the core of downtown Bennington. Colvin said the college’s withdrawal won’t have any immediate effect on the project. Because of its financial situation, the college had committed no funds to the redevelopment effort, although it had been expected to occupy some of the office space created by the project. 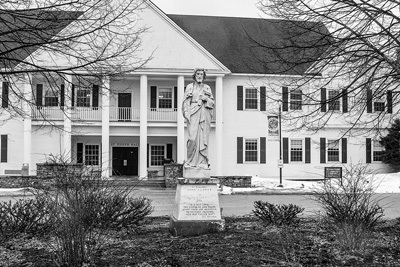 No relation to the St. Joseph Business School that was a forerunner of Southern Vermont College, the College of St. Joseph in Rutland was founded in 1956. It offered career-related programs at the associate’s, bachelor’s and master’s degree levels, serving about 350 students this year. 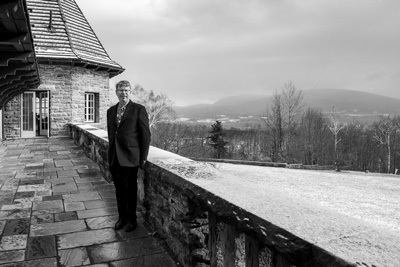 In the past few years, the college had spent about 90 percent of its $5 million endowment. Half of the money went to support development of a master’s degree program for physician assistants – an effort the college abandoned in 2016 when the program failed to win accreditation. Another $2 million went to cover operating losses as the college’s enrollment declined. In August, the New England Commission of Higher Education put the school on a two-year financial probation, then demanded a financial report by April 1. In recent months, college officials sold assets, raised funds, and tried to find a partner institution to help shore up the school as it continued to recruit students, but the potential partnership fell through. On March 21, the college announced it would close at the end of the semester. Its teach-out partner is Castleton University. The closing of the three colleges “is certainly a huge loss for the state and other colleges,” said Susan Stitely, president of the Association of Vermont Independent Colleges. The 11-member association, which included Southern Vermont College and the College of St. Joseph, advocates for the state’s independent colleges and fosters cooperation among them. News of the colleges’ demise triggered shock, disbelief and anger among students, alumni and supporters, as well as accusations of poor leadership and financial mismanagement. Save-the-college groups quickly formed at both Green Mountain and Southern Vermont. The college’s supporters have been getting advice from alumnae and students who rallied to save Sweet Briar College in Virginia, a women’s college that announced plans to close in 2015 but has managed to remain open. In that case, Sweet Briar’s alumnae raised $28.5 million in 110 days, and the state of Virginia allowed the college to tap into $16 million in restricted endowment funds. As of late March, Save GMC’s website showed a total of 231 pledges, with more than $66,000 raised and a total of more than $211,000 in five-year pledges. Southern Vermont’s alumni also rallied quickly to a rescue effort. Kyle Gilrain, a 1993 graduate, is one of the organizers of Save SVC’s online presence, which includes SVCalumni.com, a Facebook page and a gofundme page. The effort “so far is going pretty good,” Gilrain said. “We’re receiving donations from many alumni who have never given before,” he said. Gilrain called the support group “one spoke in the wheel to move the college forward.” Other efforts have included presenting a petition to Vermont Gov. Phil Scott, asking his help in keeping the college open. One goal of the alumni effort is to stress what has made Southern Vermont College special, Gilrain said. “It caters to a very specific demographic: people who otherwise wouldn’t have gone to college or graduated,” he explained. He cited his own experience: last in his high school class, now holder of a master’s degree in social work from Columbia University. “That’s not a unique story,” Gilrain said. As of March 29, the Save SVC gofundme page had raised $19,800 from 202 donors. Karen Gross, who was the college president from 2006-14 and was succeeded by Evans, said she ended her time at the school with a balanced budget despite the nursing accreditation problems and a case of embezzlement by the school’s chief financial officer at the time. “I can’t explain how it suddenly fell off a cliff,” she said. But she acknowledged that many small private colleges are struggling financially. “It’s not just SVC, but all over,” Gross said. Gross said she is determined to keep searching for possible ways to preserve Southern Vermont College and its mission, perhaps by partnering with high schools, veterans organizations or the U.S. Department of Defense’s educational system for children of active-duty military members.